Last season Arsenal failed to win the Premier League title. I realize it’s a fact that was probably missed by most football enthusiasts, but very little slips through the cracks here at Yankee Gunner Blog. We have an entire statistics department dedicated to discovering these arcane details and passing them along to our fine readers. Conversely, Manchester United were crowned champions of England this past May. Naturally, that would lead most logical observers to conclude that Manchester United were the best team in England during the 2010-11 season. But the reality is that Manchester United didn’t have to be the best team in England to win the Premier League. They simply had to amass the most points. At the risk of stating the painfully obvious, accumulating the highest point total is the only requirement for becoming Premier League Champions. There is no caveat that the table-toppers must demonstrate superiority over their closest rivals. People often say that “the table doesn’t lie.” I suppose that’s true to a certain extent. After 38 games, the team with the most points is rightly awarded the league title. The season is attritional and it takes a team with incredible resolve and fortitude to sustain their performance over the grueling 10 months of competition. What the Champions of England are really rewarded for is incredible consistency. The trophy doesn’t necessarily go to the best team. It goes to the team that can sustain a relatively high level of performance over a prolonged period. This summer there has been a lot of hand-wringing about whether Arsenal can possibly compete with the likes of United, Chelsea and Manchester City. People are lining up to point out the reasons why our rivals are better sides. They have big name stars. They have depth at every position. They have experienced players with trophies on their resume. And maybe, they are the superior teams. But as I just mentioned, that has nothing to do with becoming Premier League Champions. In recent seasons, Manchester United in particular have become masters of winning the league while failing to impress against the other top-4 sides. Alex Ferguson’s team wins titles by beating up on the clubs below the upper-echelon. It’s hard to say you’re the best team in England when you don’t take the most points from your matches against the other top sides. But none of United’s titles have footnotes beside them. You won’t see any separate Premier League table indicating their results against Chelsea, Arsenal, Liverpool or City. The history books simply list them as Champions. And rightfully so. Not only did we match United’s point total against the other top-4 sides, we probably delivered the best performances against top opposition. Even in the games we failed to win, we were arguably the better side. We drew Manchester City in a match that we completely dominated from start to finish. We lost to Chelsea in a match that we were also controlling and included Laurent Koscielny squandering a gilt-edge goal-scoring chance early in the match that might have changed the outcome. And while we probably deserved our fate at Old Trafford, it was another match that saw us comfortably on top of the opposition for long periods. But Arsenal’s results against the best sides in England didn’t win them a league title. In fact, Arsenal couldn’t even finish ahead of a club that took half the points from the same fixtures. Roberto Mancini’s side took a meager 5 points from the matches against the other top 4 teams, with a woeful -5 goal difference in those games. But Manchester City finished ahead of Arsenal in the only table that matters. 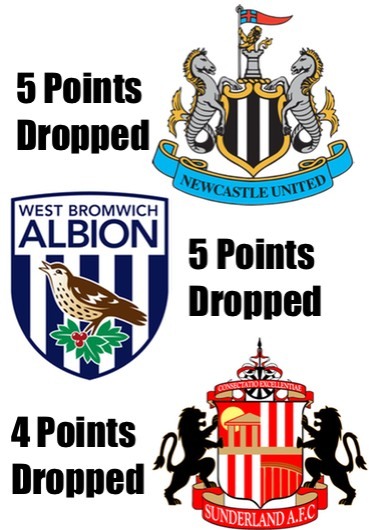 In fact, when you look back at the “top 4 league” over the past few seasons, the results are remarkable. In 2009-2010, Arsenal were woeful against the best sides. We took a shocking 3 points from the 6 matches. But after 30 rounds, we were joint top and ultimately finished third that season. In 2008-2009 Liverpool dominated the “top 4 league” with 14 points. Arsenal finished second with 9. United’s 5 points were one better than Chelsea. United won the league and Arsenal came fourth. That was a season where we spent much of the campaign fearing for our champions league future. But when it came to our performances against England’s best, we were hardly found wanting. The 2007-2008 season was the rare exception where the finishing places in the “top 4 league” matched the actual league table. Arsenal came third in both. Although that was a season where we looked the best side and destined for a title until the fiasco at St. Andrews. In that case, our general dominance of the league for most of the season was not reflected in our performances against the best sides. Once again in 2006-2007 results among the top-4 proved relatively meaningless. Arsenal topped the exclusive group, but finished fourth in the league. Wenger’s side proved yet again that they were a match for the best, but lacked the consistency against the rest. For Arsenal, there’s an important lesson to be learned from all this. Beating the best teams in England isn’t the way to win a Premier League title. In fact, it doesn’t really matter at all. In recent seasons, we failed to win the Premier League because we failed to take the necessary points from teams outside the top-4. People can say we weren’t the best team in England last season, and I’m not suggesting they’re wrong. But apparently we were good enough to beat every team that finished above us. We were good enough to take as many points off the other top-4 sides as anyone in England. And that makes our failure to finish within 12 points of the top even more disappointing. Over the past few seasons, there’s been a suggestion that something is wrong with Arsenal’s attitude. There’s a tendency to show up for matches against lesser opposition expecting to be handed the points. Often, that lackadaisical, casual attitude has earned the team a disappointing result. On the flip side, this Arsenal team has proven that it has the ability to beat anyone in Europe when properly focused and motivated. Arsene Wenger’s side seems to bring their best effort to the “big” games but not to others. It may explain why fans have become so frustrated with Wenger’s latest rebuilding project. Watching young players amble around the pitch while losing at home to Hull or WBA takes a toll on morale. Fans want to see their team fight for every result regardless of the opposition. Few fans will give up on a team that never gives up on a match. Last season Arsene Wenger lauded his team’s “mental strength.” It became something of a joke because the team seemed to exhibit so little of it. Fans witnessed a team that could collapse from any lead, and lose a game they were heavily favored to win. But that seems to stem from the lack of killer instinct. When you face lesser teams you have to start the match aggressively to show your opposition that they’re over-matched. When you have a lead, you must possess the desire to turn that lead into a rout, rather than a stroll. Goals change games and even the most comfortable match can become nerve-jangling in an instant. Title winning teams approach every match with intensity and maintain that intensity for 90 minutes. Perhaps some of that comes from maturity and the experience of knowing what it takes to win trophies. Few players on this Arsenal side have that experience or maturity. And the lack of killer instinct might well be what’s holding this team back from a Premier League trophy. Thierry Henry loved to play against the league’s lesser lights. One criticism sometimes leveled against Henry is that he wasn’t as good in the “big” games as he was against weaker opposition. But as the statistics and the history seem to show, the fixtures against weaker opposition are the “big” games. And Henry’s Arsenal used to destroy teams at the other end of the table. Those Arsenal teams had a killer instinct and that’s why we won titles. You win the league by winning the “easy” games. You win the league by putting your boot on the throat of every inferior side you face until every club is properly terrified when they see Arsenal on their calendar. If you can do that, then the matches against United and Chelsea and City don’t really matter. Who cares if they’re the “better” team? Who cares if you don’t win the “big” games? If you are sitting at the top of the table after 38 games, no one will remember individual results. When you learn to approach every game with hunger and the desire to tear your opponent apart, that attitude can become infectious. Beating weaker teams can create momentum, in the same way that losing to weaker teams can be confidence draining. If this Arsenal side is good enough to beat the best teams in Europe then surely it’s good enough to beat newly promoted Newcastle and West Bromwich Albion at the Emirates. Last season we finished 12 points behind United. We dropped 5 points against Newcastle, 5 points against Albion, and 4 points against Sunderland. We dropped a terrible 2 points at Wigan. We dropped 3 points to Bolton, 2 points at home to Blackburn, and 3 points to Stoke. That’s 24 points dropped to teams that finished 10th or lower. 10 of those points were dropped at home. And that’s where the league was lost. Not at Old Trafford. Not at Stamford Bridge. Not at the Eastlands. It was lost to lower tier opposition, and largely at home. Arsenal fans are worried that this could be a tough season for the Gunners. There’s little talk of league titles and plenty of speculation about our place in the top four. But here’s the reality: we don’t have to be one of the four best sides in England to stay in the top four. We don’t have to be one of the four best sides in England to win the title. We just need to be better than the 16 other sides in England. We already know this team can beat anyone when they approach a match with the proper attitude. What Arsene Wenger really needs to do is convince his side that the important matches this season aren’t against United or Chelsea or City, they’re against Norwich and QPR and Swansea. If he can do that, and his side show the same intensity against mid-table opposition that they did against Barcelona in the Champions League, then we could be treated to a surprisingly excellent Premier League season. Brilliant as always. Great point about utd finishing bottom if the top4 mini league and winning the title the other year. Maybe if the majorty of moaning joyless fans state away from the Grove it might help the team. Probate same ones who were moaning about yesterday’s signing…. Despite crying all summer and demanding a signing. Excellent article as usual. Sometimes the most obvious points are the hardest to see. I’d say Arsenal were the best team in England last year. We beat Barcelona. We were putting Barcelona out of the Champions League til the ref intervened. We thumped Chelsea and beat Man United. But you’re absolutely right, we weren’t the best team every week, and that’s how you win a title. It’s like when you enter a university and only studying for the sake of the exam and not to be the best in yer profession. Kinda depressing when yer think about it isn’t it ? To have depth, you only need a deep pocket.